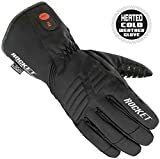 These Joe Rocket Burner heated gloves are different than most heated motorcycle gloves because they’re wireless which has it’s pros and cons if you ask me. It’s great that you can keep the heat running when you step off the bike. Usually you have to unplug the cord from the motorbike every time you step off. If you’re like me you sometimes forget to unplug and then you go to walk away from the bike and have a near wreck because you’re still attached. But that’s my clumsy self and probably not the norm. In addition to that it also makes these gloves really versatile because the heat can work anywhere. I used them for shoveling snow and walking the dog which isn’t what they’re designed for but they work well anyways. You could even wear them skiing. The biggest con is that you have to recharge them after every use. This isn’t ideal especially if you’re used to 12v gloves where this isn’t a factor. In the end they’re good gloves for the money and I really like the versatility. You can also get these same gloves with leather instead of nylon which is a little more expensive but a nice option to have. Here’s a quick video showcasing them. I found them to be really comfortable. The heating elements are in the back of the hand and fingers so you can’t feel the wires when you’re gripping the handle which is nice because I’ve tried some heated gloves where the elements were bulky and you could feel them. They have a bit of a gauntlet which you could put over top of your jacket sleeve if you wanted to but I found it more comfortable to put underneath the sleeve since it’s not that big of a gauntlet. As you can see there’s a pretty big velcro strap that you can use to tighten the gauntlet to your desired fit and there’s also an elastic band lower on the wrist which keeps them snug and form fitting. It’s hard to tell in the pictures but the battery actually fits on the inside of the wrist which is different from most battery heated gloves. Usually it goes on the outer part of the wrist. This is something I didn’t love, I think it would be a bit better on the outer part but not a big deal. They have 3M Thinsulate insulation which does a pretty good job of keeping the heat in. They kept them pretty thin which is great for dexterity and mobility but without the heat on they aren’t all that warm. With that being said they warm up quickly as soon as you turn them on. There are 3 settings of heat and the warmest setting gets toasty warm. I would say that they don’t get quite as warm as your average 12V gloves but considering it’s a wireless battery it’s actually quite warm. For comfort I’m giving them a 18/20 and for warmth I’m giving them a 17/20. The exterior of the gloves is made out of a heavy duty nylon material which does a really good job of repelling the water but if any manages to sneak through there is a second line of defense. They have a HiPora liner which is Joe Rocket’s patented material. It’s fully waterproof, windproof and breathable so your hands will stay dry in any condition. Even a torrential downpour which I can attest to because I used them on a very wet day. Another nice thing is that the palm is made out of a synthetic suede material which remains grippy even when wet. For this category I’m giving them a 20/20. If you haven’t tried any Joe Rocket Gloves before then you’re probably wondering about the quality. I initially bought a pair of Joe Rocket gloves when I first got into riding mainly because they were cheap and they looked good. I think that’s actually what a lot of people think of this company. They look good and they’re cheap. The truth is that in the early days of the company the quality wasn’t all that great. They would offer some protection but they just weren’t as tough as some of the higher end brands. Over the years I’ve tried all sorts of different Joe Rocket gear including a jacket and I’ve really seen the quality improve. These gloves are no exception. They’re built really tough and even the electrical components are built to last. The stitching is tight and strong and the materials are good quality. Not the highest end but still good especially for the price and if you prefer leather you can always pay the extra money and get the leather version. I’m giving them a 17/20 in this category. This is a really important category. As we all know safety is a huge part of motorcycle gear and it’s always something you should consider when shopping for gear. As I said before these gloves are made from a tough nylon exterior which is designed to hold up well in the event of a crash and protect you from road rash. The cuff can be tightened a lot so that they shouldn’t come off in a crash. The knuckles have a polyurethane protective piece right under the nylon for extra protection which actually really impressed me. Maybe not quite as strong as carbon fiber but still a hell of a lot better than nothing. The palm is covered with a synthetic suede which isn’t as good as leather in a crash but you can always upgrade to the leather option if you’re concerned about it. I’m giving them a 18/20 in this category. Each glove comes with a lithium-ion battery which fit’s into a little pocket on the inside of your wrist. This battery is advertised to last up to 4 hours on the lowest setting and 2.5 hours on the highest setting. My experience was slightly different than what the Joe Rocket website says but pretty close still. I was actually able to get 4.5 hours of heat on the lowest setting which was a nice surprise and 3 hours on the highest setting. I know it probably doesn’t sound like much but that’s not too bad when compared to some battery heated gloves. The truth is that you usually won’t want them on the highest setting all day anyway because it will get too warm and you don’t want your hads to sweat. A normal day would entail switching between the three settings and off all together which will allow the battery to last pretty much all day. The charger that comes with them is good for charging both batteries at the same time and it takes about 3 hours to get them to a full charge. All in all I was pretty happy with the batteries and if you were so inclined you can buy a spare set of batteries so that you can extend the life. I usually wear a large but with these I probably could have gotten away with an XL so I would say that they fit a little bit small. With that being said the large was still okay for me. If you’re unsure about what size to order you can have a look at our sizing guide and see what’s best for you. All in all I thought these were a good value pair of gloves. The only thing that I haven’t mentioned yet is that they are compatible with touchscreen devices. The index and middle finger have a layer of conducting material so you don’t have to take them off to check your messages or missed calls. This is a nice feature that I’ve become accustomed to so I’m glad they have it. Overall I’d say that the Joe Rocket Burner heated gloves exceeded my expectations and I’m surprised how positive this review turned out. Not that I thought they would be bad it’s just that I was a little concerned about the reliability of a wireless heated motorcycle glove but fortunately they were good. If you have any questions or comments please use the field below and I’ll be sure to respond ASAP. An interesting review. I always wondered how people who ride motorcycles kept their hands warm. My nephew rides a motorcycle, yet he has never said anything about wearing gloves that have heat in them. I’m pretty sure he does, cause he rides around in pretty cold weather. Now you’ve given me some ideas on what to buy him for his birthday coming up very soon. I think these gloves will be perfect for him. That’s great to hear. I’m glad I gave you an idea. These would be a good gift for any rider especially considering they’re versatile enough to wear for other activities aside from riding. Just make sure you know what size to get him and be aware that these do run a little bit small. These Joe Rocket Burner Heated Gloves sound the real deal. My hands were always frozen riding a bike however back then heated gloves hadn’t been invented. I like the idea the charge lasts about 3 hours on the warmest setting, I think that’s pretty fair, it’ll last most journeys. The quality of the water resistant material with the thinsulate insulation, velcro strap and elastic band are great features whist the way the battery fits on the inside of the wrist sounds excellent. I think I could do with a pair of these for walking and as you say, great for shovelling snow. Thanks for the video, they look great. Reviews are excellent too. I appreciate the comment and the kind words. I know what it was like before heated gloves were a common thing and I have to say that it changed everything for me when they became available. One thing to note though is just how good the quality is nowadays. In the early days of heated gloves the batteries were bulky and didn’t last very long but thanks to advances in technology they really are awesome now. Let me know if you have any questions . I’m a pretty avid rider and am always looking for a quality glove. I’m glad to see that you noticed the sizing difference too. I’ve noticed the same thing with most rocket wear. My question is are the gloves washable or will doing so damage the glove? I don’t ride in weather cold enough to worry about heated gloves but do use them for snowmobiling. They are a lifesaver for that application. These gloves aren’t machine washable but there are some effective ways to wash them by hand. You can pull the interior of the gloves inside out and then wash them by hand. Then you can do the same with the exterior. Just make sure that you remove the battery first and try not to get any water on the power plug. Then when you’re finished be sure to hang dry them as putting them into the dryer will not be good for them. Hi there, thank you for introducing me to such a neat product. The video really helps to explain more info about the product which is nice. Thanks for the questions. Yes there is warranty offered by the manufacturer which is good for all parts for one full year. I’ve used a lot of Joe Rocket gear and I have to say that they have great customer service. As for the shipping, yes they do ship internationally but it will be quite a bit more money. Unfortunately it will cost an extra $60 to ship to Malaysia. I think you would be better off trying to find a company selling this product somewhere closer to home. But it’s totally up to you.